Dutch designer Bertjan Pot is famous for his high-end commercial products, like the Random Light for Moooi and the Jumper chair for Established & Sons. 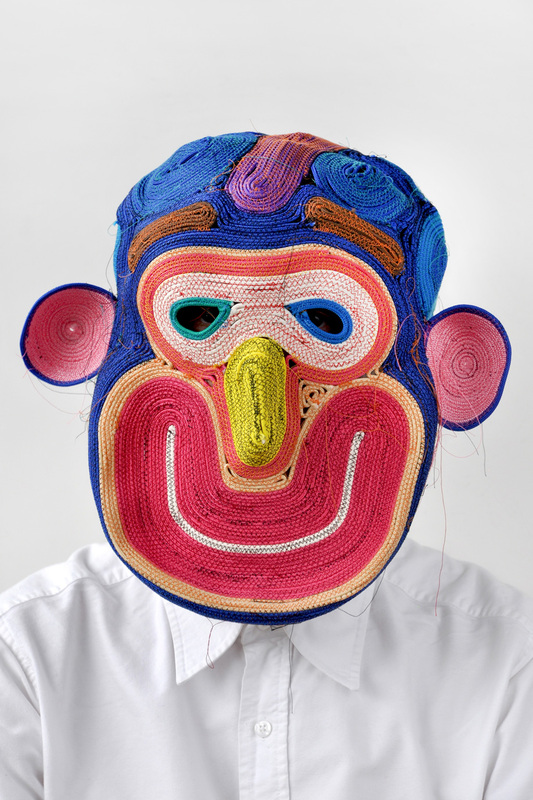 He is also known for his colourful – and delightfully oddball – rope-woven masks. We caught up with him to discuss his experimental approach to design. Bertjan Pot isn’t like most designers. As widely acclaimed for his high-end commercial products (his Random Light for Moooi is now a classic) as his colourful woven-rope masks, he clearly isn’t afraid to toy with expectations and to push the limits of methods and materials. Whatever he’s working on, though, he prefers to keep things simple, eschewing technologies such as 3D printing in favour of techniques like knitting, knotting and weaving. 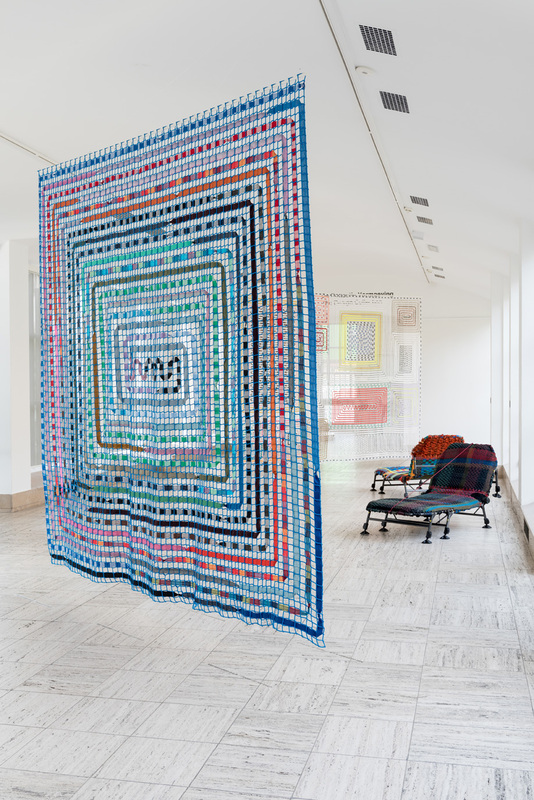 In most cases, Pot starts off by taking something small – a piece of yarn or a bead, for instance – and then follows a sequence of repeated gestures to turn the everyday material into something radically different. You could say he adds the “extra” to the ordinary. Like many of his contemporaries, Pot embraces a handmade aesthetic, but with an intellectual focus. Beauty, in his view, isn’t about perfection; it’s about finding solutions. And design is about engaging the mind as much as the senses. Despite their simple appearance, Pot’s objects often present answers to problems we didn’t know we had. He doesn’t really care about making things look pretty or polished. What matters most to Pot is that they get people thinking. The past two years have marked a significant departure for the designer, who devoted all of 2017 to creating new personal work. 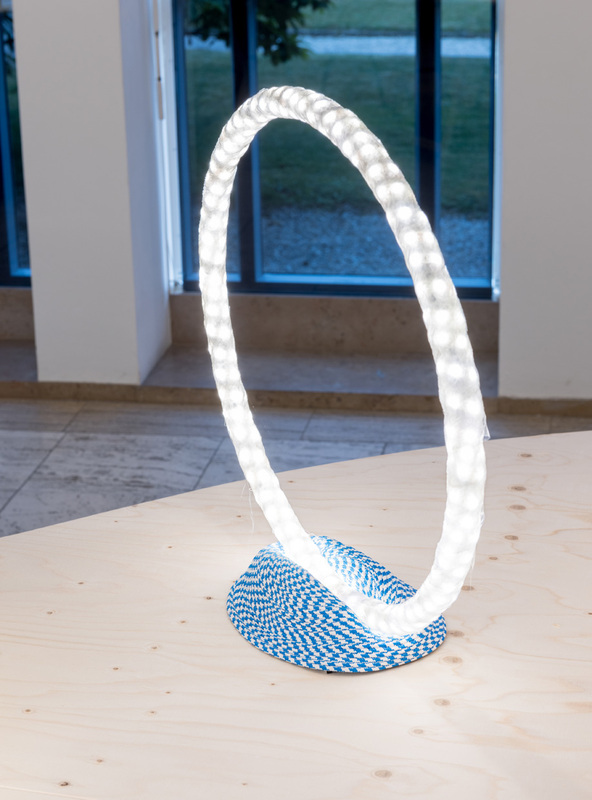 The results were on display this summer at Rotterdam’s Museum Boijmans Van Beuningen in an exhibition called Hot Glue. Playful as well as profound, the pieces on show offered an intimate glimpse into Pot’s unique approach to design. Maria Elena Oberti caught up Pot during the exhibition’s run to find out what makes him tick. 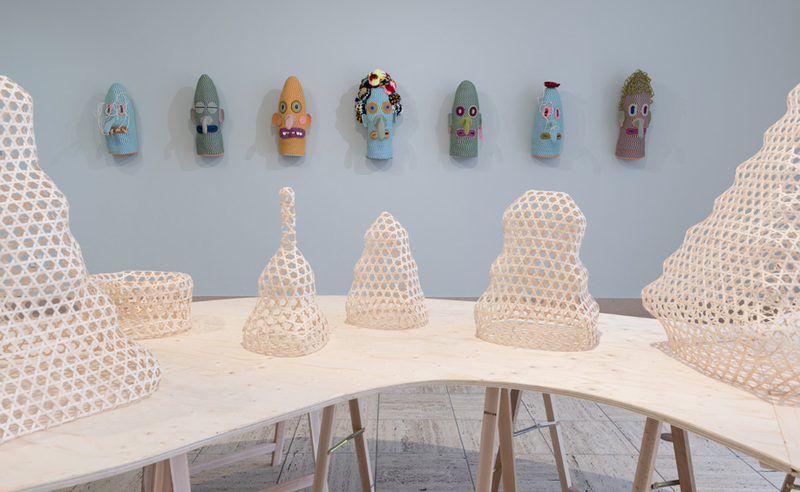 New machine-sewn versions of Bertjan Pot’s signature woven-rope masks watch over an array of his triaxial baskets in the Hot Glue exhibition. What was the thinking behind the exhibition and the name Hot Glue? I thought a great deal about what I should present at Boijmans. I knew I didn’t want to show old work. The idea of having to dig up and sift through 20 years’ worth of work seemed like a tedious and useless exercise. I decided to use the exhibition as an opportunity to focus my energy on what I enjoy doing most, which is making prototypes. I think the first prototype is often the nicest, because it’s still open and unfinished. If you look closely, a lot of the pieces in the exhibition will have strings of glue hanging from them. The name Hot Glue is a reference to the quick and dirty manner in which [the pieces] were made. Why was it so important for you to focus on new work? I wanted the exhibition to look forward, not backward. The exhibition was also a good excuse for me to devote an entire year to making things I normally wouldn’t have time for. When you design a product for a brand, you’re constricted by a brief. You start off with a handful of ideas and then filter them down until you have a product you can take into production. Working on an exhibition has the opposite effect. One idea quickly turns into many until what you have is a room filled with lights. It’s unusual to see so many prototypes on show by a single designer. You shouldn’t see them as prototypes. Many of the pieces are finished products. Some of them are sketches that could be turned into industrial products, but others are finished products. Design isn’t always about perfection. How do you know when a product is finished? When it has found its destination. Take the light made out of set-square rulers. 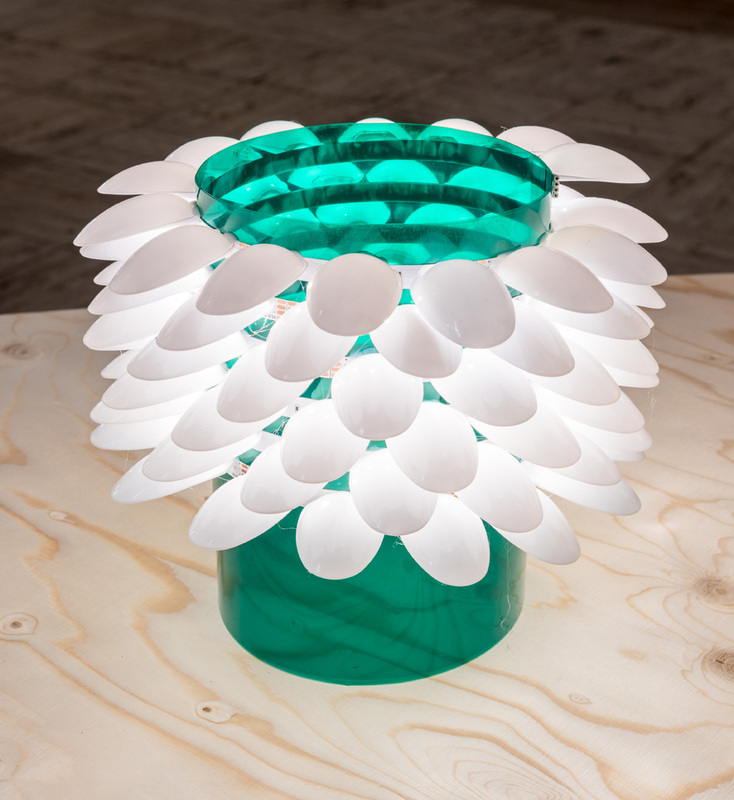 Basically, it consists of 60 plastic triangles that are glued together to form a lamp. To me, that piece is already what it should be. I might make it a few more times for friends, but, as far as I’m concerned, it’s finished. What makes this particular piece more finished than others? Even if we could make it 1,000 times over, it’s not something you want to see all that often. At some point the joke wears off. Not every product has to be mass-produced. That said, there are things in the exhibition that are the beginning of an industrial idea. Those will be done once I’ve found a company that wants to produce them using industrial techniques. You have compared your Tabletop lights to a joke. Are your designs meant to be funny? I used to get this kind of question a lot, and would be quite insulted by it. Yes, the lights are funny, but they’re also meant to be dead serious. A joke needs an element of truth in order to be funny. It’s the same with my designs. They might make you laugh, but they’re also there to say something. 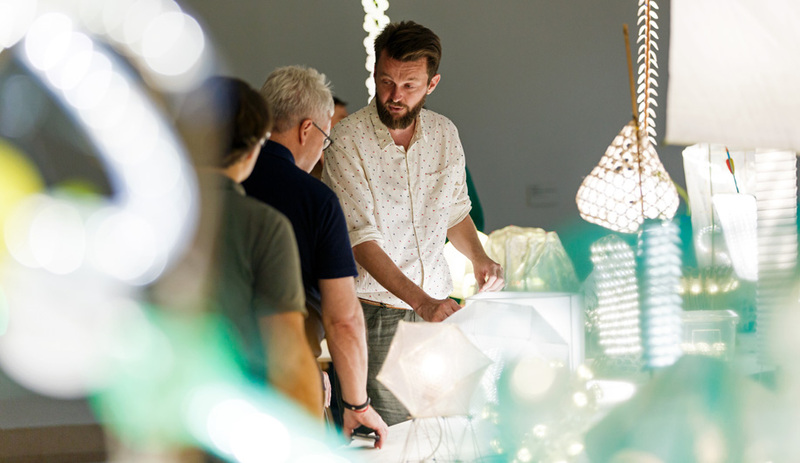 Experimental lamps in the show include one with a shade made of clipped plastic-spoon heads. Your designs often consist of taking everyday objects – like set squares – and turning them on their head. What attracts you to ordinary materials? I use these things because they happen to be ideal. Take the light I made with all the plastic spoons. I could have made something out of paper or had a mould made to get that same shape. But then I saw a plastic spoon and thought, why don’t I just cut the handle off? I don’t care whether or not people recognize it’s a spoon. That’s not the point. Using these kinds of materials helps me work faster. Plus, it keeps things fun. An experimental lamp cradled in a stitched-yarn base. How do you decide what to make and what materials to use? I’m always looking for new ideas and thinking about how I can combine things in a new way. I keep track of all my thoughts on a list in my phone. It consists of random notes like “paste macaroni on LED lights” or “scaffolding structure out of bamboo covered up in rice paper.” Sometimes it’s just a material I’ve seen somewhere that I’d like to explore. I refer back to this list whenever I need inspiration. What makes a material interesting to you? If it has possibilities. I can tell you what’s not interesting to me and that’s new materials, like 3D printing. Design is about adding value to material. You don’t need to be a good designer to work with a perfect material. I’m more interested in taking a material that has been around for a long time and doing something completely new with it, something no one else has thought of yet. I think that’s more challenging. Tape, beads, plastic bags and netting are among the humble materials Pot employs to fashion eye-popping tapestries and furniture. The aim of much of his work, he says, is the creation of finished products greater than the sum of their parts. The term “innovation” is used ad nauseam today in relation to anything that’s new. What’s the recipe for groundbreaking design? If it isn’t innovative, you shouldn’t make it. Innovation, like creativity, is one of those words that has lost its meaning. Craft is another word that I’m very tired of hearing. What is craft? Everything that a person makes is craft. My problem with the way people use craft is that they use it to refer to a production technique that isn’t relevant anymore, because we’ve found something better that’s faster, cheaper or less labour-intensive. But it’s up to you to use a technique and find the relevance in it. Relevance isn’t about being romantic about how something is made; it’s about adding value and proving that whichever technique you use is the best way to make something. Is there a difference between designing and making? Yes. Design to me is anything that doesn’t come from nature. A tree isn’t a thing of design, but a tree that’s been trimmed by a gardener is. Anybody who makes something is a designer. What I like about making, specifically, is that there is more room for problem-solving and improvisation. You’re free to try different solutions, whereas with design you’re often looking too far ahead – your thinking is limited by the objective of an end product. You often use textile techniques like knitting and weaving to compose your pieces. What originally drew you to textiles and why is it still a source of interest? I first started working with textiles as a student at Design Academy Eindhoven. What I like most about textiles is that it’s rational; it follows logical steps. You start with something very small, a fibre, and work with it – twist it, knit it, knot it, weave it – until you get something much bigger and more beautiful. Nature works in the same way. Everything in nature is made by simple rules that have been repeated. Most of my products are based on this principle, of taking something small and repeating it. If you were to take a cross-section of any of my objects, you’d find the DNA of that product. An architect chooses materials at the end of his project, whereas I choose materials at the beginning and build on them. You recently started weaving baskets and sculptural objects out of rattan. How does it differ from working with fabric? I began dabbling with rattan last year. I had always wanted to try working with the material, but couldn’t find a manufacturer in Holland that would sell it to me in bundles. Normally when you weave you work on a set of two axes. With rattan, I use a process called triaxial weaving, which instead uses three axes. You get much stronger shapes, both visually and physically. I experimented with weaving different sizes and shapes and the result is what you see in the exhibition. What I like about them is that they are extremely logical shapes that are somehow also very natural. The exhibition features a number of new masks, even one made of rattan. How did you start making masks? The masks started off as an experiment with string. I was trying to make a carpet but the results were always too flimsy. One day, an assistant asked me what I was making. I playfully held a piece to my face and said, “A carpet.” Seeing this, my assistant suggested that I make a mask instead, so I did. In the end it turned out to be the most powerful application for the material. I’ve made around 250 now. How do you hope people will react when seeing your work? It might sound cheesy, but I hope that they will be inspired. I had an exhibition here in Rotterdam a few years ago. A friend approached me after and said, “I went to see your show with my nephew and, as soon we left, he said, ‘I want to make a tree house!’ ’’ I thought that was the best reaction to an exhibition. I don’t see why he’d want to make a tree house, but something got him thinking. That’s the most I can ask for. Besides inspiring others, what do you hope to accomplish in the next 10 to 20 years? I want to keep things interesting and keep having as much fun as possible. In the end, that’s what’s most important. This story was taken from the October 2018 issue of Azure. Buy a copy of the issue here, or subscribe here.